Thanks for all the support and love sent my way. It was a weird little medical episode I went through a couple weeks back but I’m feeling 100% now. I have passed every test with flying colours! You can read my original post by clicking here. Update on my new book and my search for an agent: I’m still seeking. I’m thinking this could take some time. There’s been interest and I have a meeting, but I’m patient and I think that’s the right frame of mind. This is a time to wait. And wait. With a side of wait. And now my big news of the week: I’ll be at Fan Expo August 28-31 in Toronto. Available for visitors this year will be my new signed prints, as well as my new greeting cards. I have added them to my online shop, so you can see the prints here and the greeting cards here. 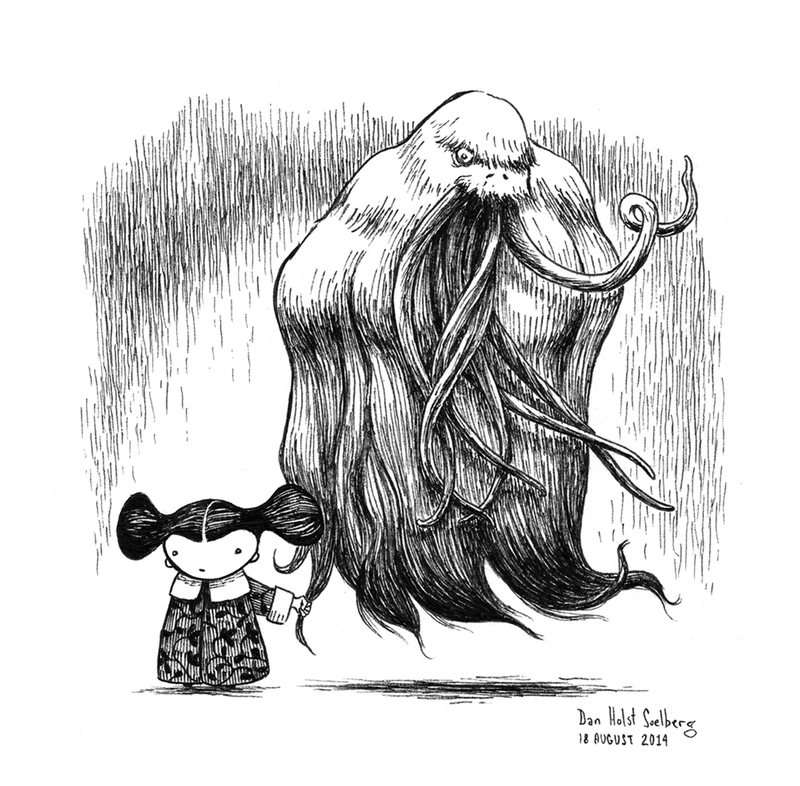 I’ll also premiere the 2015 calendar with illustrations from Dwellers of Lurching Swill. Calendars are updated to include Canadian holidays, thanks to the sage advice of Stacey Thompson. 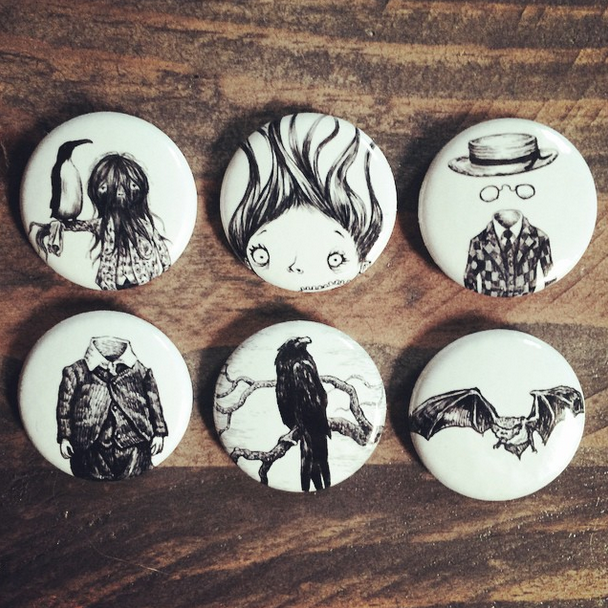 My button supply has been replenished thanks to Lisa Bell at nerdbiskit (check out nerdbiskit’s tumblr here), and posters are well stocked. If you want me to sign and dedicate a book, just ask and I’ll be more than happy to oblige. You’ll find me in the Artist Alley at table A265. 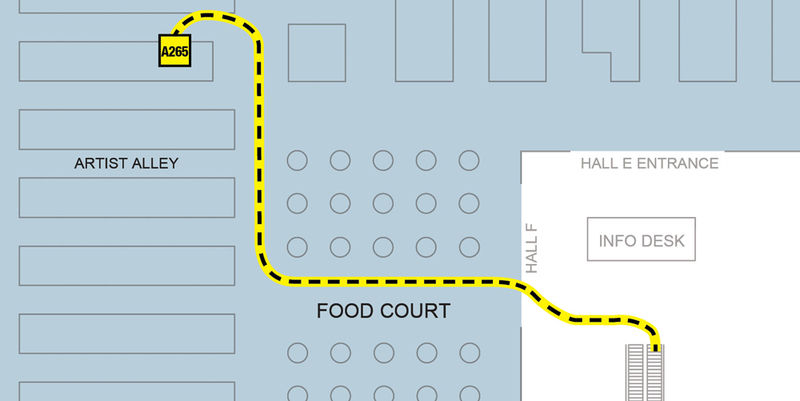 You’ll find me at table A265, near the South Building’s main food court. Once you get off the bottom of the escalators of the South Building, turn left past the information table, enter the Hall F Entrance, and walk past the food court to my table. My poster tower should be recognizable from the aisle. For all the Fan Expo information you need, please check out the official site here. I’m excited to see all my friends there. I’m on the hunt for some comics this year too! The campaign to get Concrete Martians Part Two published starts today. My friend Keith Grachow is the illustrator and Mitch Cook is the writer. Keith asked if I wanted to help get this publication off the ground and I’m happy to lend my support. I wanted to draw a martian, so I imagined one of my sweet little characters befriending one. I call it My Martian Friend, an 8″ x 8″ ink drawing on watercolour paper. If you want to claim it, or support the campaign to get your very own copy of the new Concrete Martians, click this link. Good luck to Mitch and Keith! 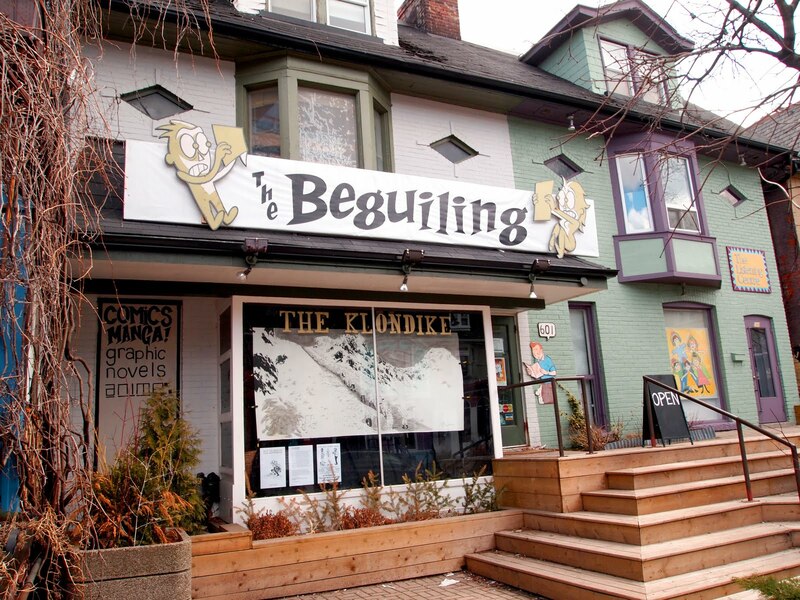 The Beguiling is a Toronto shop in a category of its own. And now it carries my books. I’m guessing that kind of thing happens a lot at The Beguiling. And now The Beguiling is selling my books in soft cover. I couldn’t be more excited! 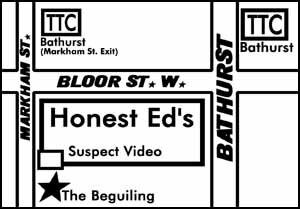 I am an enormous fan of The Beguiling and their devotion to (as their own website puts it) “alternative, underground and avant-garde graphic story telling.” If you haven’t visited The Beguiling before, make a point of going there soon. 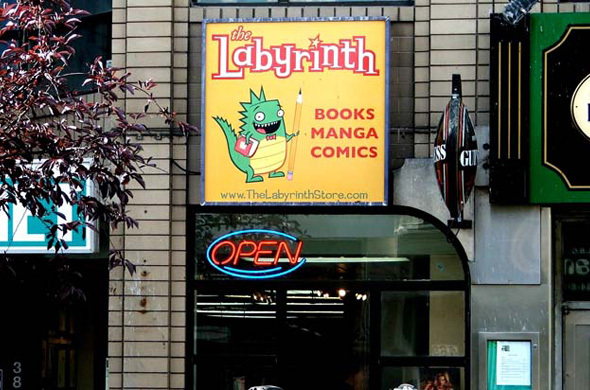 One of Toronto’s best comic shops, The Labyrinth is carrying my soft cover books! I strolled into the shop with a cranky baby in a carriage and my four-year-old about to unleash his pent-up energy. The jam-packed Toronto shop was absolutely buzzing with patrons and summer heat. 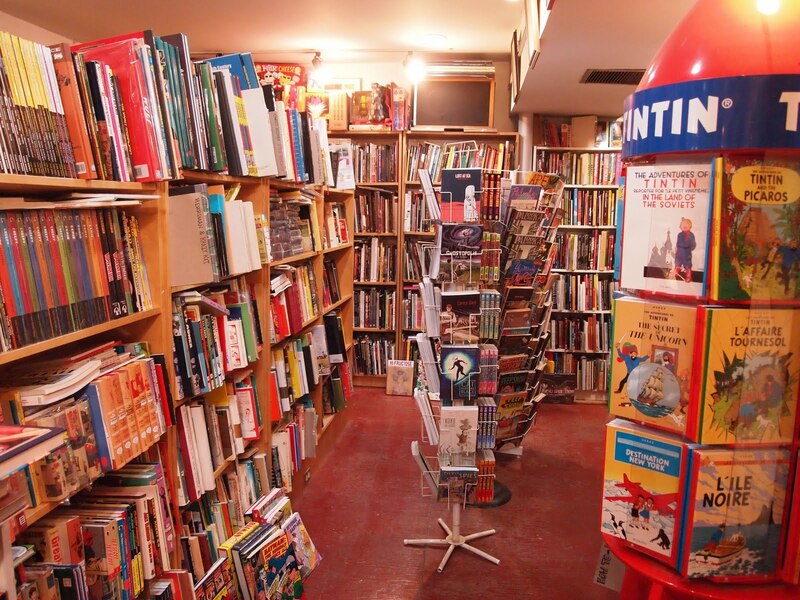 It was just as I started chatting with the owner, Dan, about selling my books in his shop that the baby let loose her break-down sobs and the four-year-old decided to ask rapid-fire questions. Dan assured me that this was nothing compared to his kids. He was being kind, but it was exactly what I needed to hear at that moment. Over the alarm-bell whoop and wail of little people, Dan snapped up several copies of the books. I couldn’t be more pleased. 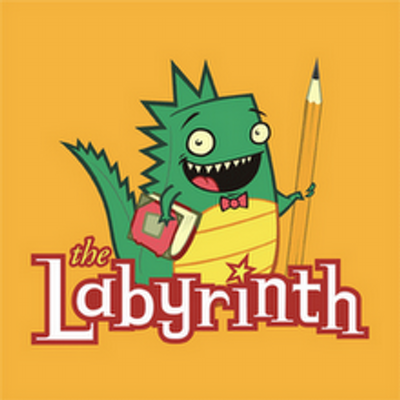 The Labyrinth books is at 386 Bloor St W. just west of Spadina Ave. near Dalton in the Annex neighbourhood of downtown Toronto. You can see a map by clicking here.